This is the beautiful Zoya Reagan. 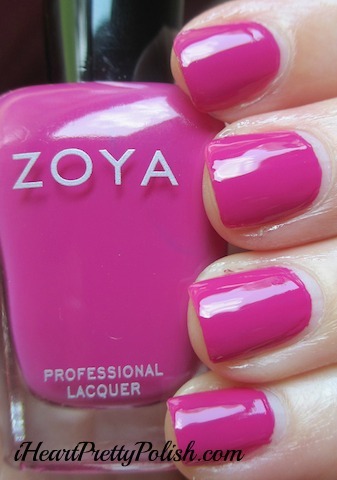 Zoya describes it as a deep, cool fuchsia pink with subtle blue undertone and an opaque cream finish. I was looking for a raspberry shade and this is it. It applied perfectly - as with most Zoya's - and it looks so juicy and girly:) Love it! If you are interested in Zoya, I have a referral link on the right side of my page if you scroll down. Also, it helps to be a fan of theirs on Facebook because they are always posting specials. I got this with a 3 for $10 special. Thanks for visiting! I love colors like this (I have like, three very similar ones) and I really like the name Reagan. I read Nora Roberts in my early twenties and the main character in the first book I read's name was Reagan, lol. But anyway. It is a gorgie color and it's lovely on you. Nice watermark, too, btw. I know you've had it for a few days. I've been thinking more that I ought to do one because then it'd be easier to find my own searches in Google searches. Lololol. What's wrong with me? !